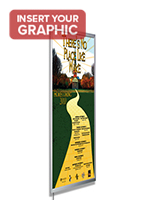 These Long Lasting Sign Supplies With LEDs Are Our Thinnest Models In Stock! 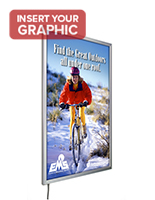 Combine Durability With Advertising Potential With These LightBox Sign Supplies! 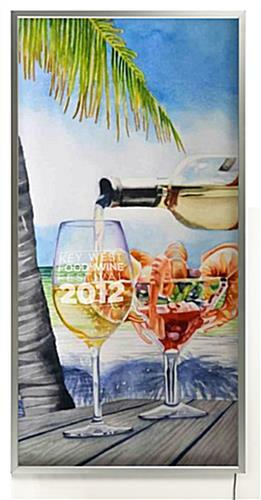 Order From Our Stocked Online E-Catalog Today! 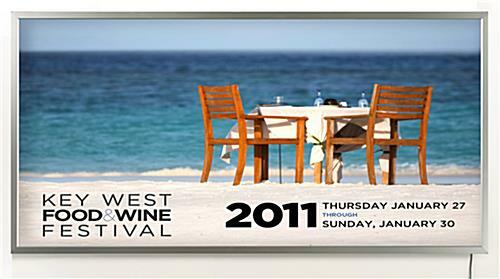 Media Size: 36" x 72"
22" x 28" 22" x 56" 24" x 36" 27" x 41" 36" x 48"
Although initially, these innovative sign supplies for commercial display are more expensive than conventional LED frames, these backlit display panels have several advantages that outrank the expense. 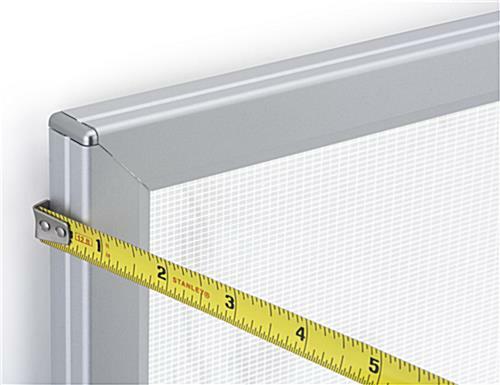 Because LED bulbs tend to be smaller and of heartier stock than neon bulbs, these LED frames are thinner and will, in reality, save you cash in the long run (in electrical power bills). Every one of these sign supplies has life span of over 100,000 hours. 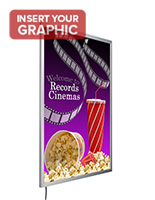 Due to this, backlit frames make excellent permanent displays in airports, shopping centers, and stadiums. While neon sign supplies may additionally provide vibrant illumination in big measurements, their bulbs only last for about two (2) years before you must replace them. These light boxes, on the other hand, provide satisfactory brightness and maintenance-free usage for over eleven (11) years! Please Note: LED lights are not measured in terms of Kelvin; our best approximation is a 6500 Kelvin color rating. Nevertheless, our company does not warrant this measurement, as it is just an approximation by us. The producer of LED lights does not officially measure officially Kelvin Color ratings. If you are searching for a big format LED frame with satisfactory brightness and little maintenance, then our company has the sign supplies you need! 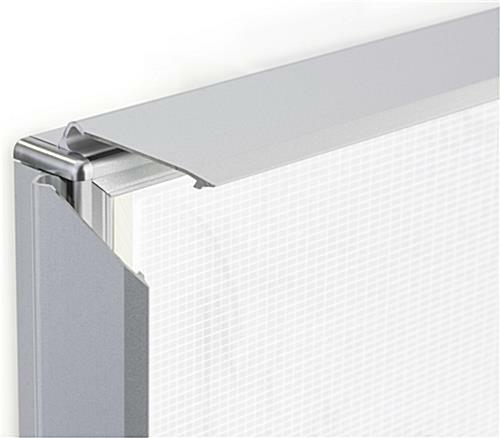 Powered by state of the art LED technology, these sign supplies provide vibrant, even illumination in our thinnest profile ever. 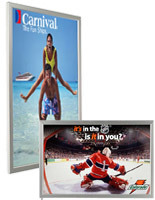 Measuring only .83" thick, these sign supplies are a few of the most attractive LED frame showcases for sale today. 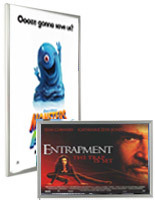 With tiny LED bulbs constructed into the sides of the framing, these sign supplies light up your translucent images to make astonishing artistic showcases without hot or cold spots. A special diffusion pattern in the framing assures that all you view is vibrant, shadow-free illumination, even in extremely big measurements. With a "clip-open" border on the case, these distinctive sign supplies for sale are also extremely practical. 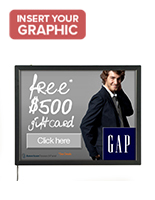 You can modify your images with little work, without even taking your panel off the wall in fact. 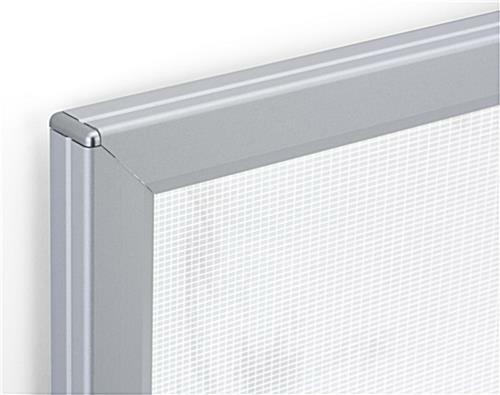 Four predrilled holes enable you to attach your LED displays in portrait or landscape orientation, while rounded corners guarantee no one gets injured on sharp edges. 36.9" x 72.9" x 0.75"